These speakers offer an incredible sound, with an amazing degree of detail. Vocal reproduction is especially commendable, and lively mid-tones lift your music to a whole new level. The Eclipse TD-M1 is not a cheap pair of speakers. In the UK they cost £999 and many will balk at the idea of spending a pound shy of a grand on a pair of 2.0 speakers. But ease of use, stylish good looks and – most importantly – a gorgeous sound make Eclipse's TD-M1s a reasonable option for those who can afford them. TD-M1 is a 2.0 system, that is, two discrete speakers but no sub-woofer to boost the low end. As you can see from the pictures, the speaker units are ovoid in shape. This is to preserve the purity of the waveform, ensuring the accuracy of its sound reproduction. The theory is that by losing the flat internal surfaces found in more box-like speakers, internal vibrations and echoes are diminished. This gives a more precise sound, reproducing rises and falls with a greater purity, giving an 'accurate waveform'. Mounting the full-range driver on a five-point diffusion stay, isolating it from the enclosure, further reduces vibrations. The speakers also have an integrated 24bit/192khz digital-to-analogue converter (DAC), so there's no need to install one separately. The Eclipse TD-M1 speakers are designed very much with the Apple user in mind. Naturally, they're AirPlay-compatible. 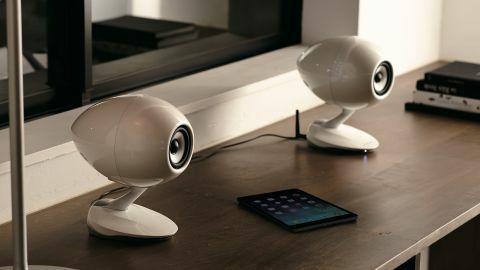 You can connect your TD-M1s to your home network and stream music from sources that offer AirPlay and are connected to the same network, but they also offer a direct AirPlay connection. That is, you can stream from compatible devices directly to the speakers, without using a network at all. Other connectivity options are available, of course. There's a USB A socket for your iPhone, iPod or iPad (which charges them as well as providing an audio input source), a USB B port for connection to a PC or Mac, and a 3.5mm AUX socket to connect external devices such as a TV or CD player, or just about anything that can take headphones. If you own an iPhone, iPad or iPod touch, you can control your TD-M1s through an iOS app. This lets you put the speakers into standby mode, choose an input source, adjust the volume and mute the sound altogether. Through its settings menu, you can also adjust the dimmer which reduces the brightness of its LEDs after use, set the automatic standby time, and switch the DAC filter on or off. If you don't own an iOS device, you're stuck with the on-board controls – there's no remote in the box. Speaking of on-board controls, you get a power button and a volume slider with volume up/down buttons. These also double as an input source toggle and a switch between network and direct Wi-Fi modes. All buttons are touch-sensitive, so there's no physical button to mar the TD-M1's sleek lines. They're neatly integrated into the base of the right speaker, with LEDs that fade away after use so they don't spoil the speaker's aesthetics. An LED indicator in the centre of the base shows its current state according to colour and whether it's steady or flashing. Unfortunately, neither the controls nor the indicator are as instinctive as I'd like. Best stick to using the iOS app as a remote. If you can't, you'll probably need to keep the instructions handy for a while. Aesthetics have clearly taken a high priority in the design of the TD-M1 speakers. Available in white or black, the latter looks stunning next to a new, drum-shaped Mac Pro, which is probably why they're sold in Apple Stores. Although pleasingly shiny, they don't pick up fingerprints as much as you might expect. The drivers can be covered by optional grilles, and the weighty stands let you tilt the speakers at three different angles; 0 degrees (horizontal), 10 degrees and 20 degrees of elevation. Just the thing if you need to locate them on a desk or shelf at below head height. Optional tall floor stands and wall or ceiling-mounting brackets are also available (sold separately). Even the briefest listen clearly shows Eclipse's TD-M1 speakers are something special. The ovoid design and vibration-reducing features have certainly paid dividends. The purity and clarity of the top end has to be heard to be believed. Vocal reproduction is especially noteworthy. Every note and nuance is reproduced with pitch-perfect precision, giving a warmth and depth that's seldom heard on home speakers. Suddenly, the £1000 they cost doesn't seem such a ridiculous amount to pay after all. If you like opera or classical music, they'll add a whole new dimension to your music collection. Mid-tones are crisp, rich and clear too. Indeed, the sound stage as a whole is beautifully realised, with each individual element flawlessly integrated into the overall audio output, giving a completeness that's sorely lacking in lesser speaker sets. Lively and intense, the TD-M1s can breathe new life into your old CDs. Subtleties and intricacies you might previously have lost will at last be noticed as they benefit from the incredible detail offered by the new Eclipse speakers. The lack of a subwoofer could be a sore spot for some as the TD-M1s certainly don't boom like the Creative T4 Wireless or the Acoustic Energy Aego M 2.1 systems. Basshunters might find them a little restrained, then, but for those who simply demand excellent, flat reproduction of lossless sources, the low end fills out really quite nicely. There's a crispness to the low frequencies that you won't find on most other speakers of this size, and the result is a smooth soundscape that shows no significant weaknesses. The Eclipse TD-M1 AirPlay speakers offer a beautiful sound, but they're not for everyone. In taking a new look at the way speakers operate they will suit the very discerning jazz, classical and easy listening enthusiasts, especially when accurate vocal reproduction is demanded. However, rock or hip-hop fans that demand an intense, thumping bass might not appreciate them quite as much. Make sure you don't waste their talents on over-compressed MP3s, too.